In January, Australian artist Sonia Singh captivated many with her make-unders of popular hypersexualized dolls, like Bratz. Artist Wendy Tsao was one such fan, and now she&apos;s taken Singh&apos;s work a step further. 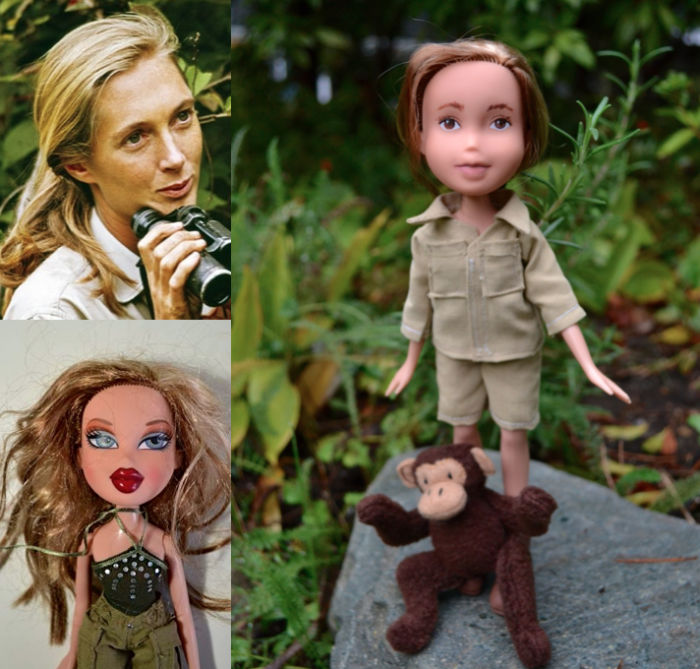 Her made-under figurines, which she calls "Mighty Dolls," are not only made-under, but also modeled after real, noteworthy women like J.K. Rowling and Malala Yousafzai. "I really admire the women that I have featured in my Mighty Dolls, for what they did or achieved and continue to do," Tsao told Mic. "And they should be role models instead of, or at least alongside, the products of Disney and Hollywood." The dolls, Tsao said, are specifically meant to be the child versions of the inspiring women she has featured thus far. This occurred to the artist while looking at a children&apos;s book about a young Jane Goodall. "I realized that kids would identify more with this version of Jane Goodall, a child just like themselves," Tsao told Mic. "We need to show children that these remarkable women were once children, too. And that everyone has a potential." Rocking the doll world: Tsao and Singh aren&apos;t the only creators who know how dolls can inspire young women rather than make them feel inadequate. Lammily touts realistic proportions; the Angelica Doll and Elle & Cee&apos;s World Girls are racially and aesthetically diverse dolls that represent a variety of aesthetics; and some dolls have disabilities — it seems we&apos;re in the midst of a doll revolution. Since studies have shown dolls can impact their young owners&apos; body image and career aspirations, it seems the Mighty Dolls and their peers are on the right track to creating lasting positive change. "I wonder if a child who plays with a doll of someone who is a real person who did some amazing things when they grow up might think more about real life things and appreciate more the real potential that lies within all of us, than when she or he plays with say, a Disney character or Bratz doll," Tsao said. "We &apos;outgrow&apos; our toys — be it a Bratz doll or Disney princess doll. It&apos;s hard to imagine feeling the same the about Malala [Yousafzai]. Can you outgrow Malala?"